This post was written on July 11. An early morning departure by one boat gets beaten back by high wind and seas. But the wind dies throughout the day, and we try again around 2 p.m., working the edge of the shelf south to Cross Harbor Point (about 16 miles southeast of the field station). Finally at 4 p.m., we sight a group of Blainvilles beaked whales, five of them including and mother and calf, an adult female, and two adult males. Diane and Charlotte were particularly excited about this sighting because it was the first time they had seen two adult males together in a group in the long term study here. 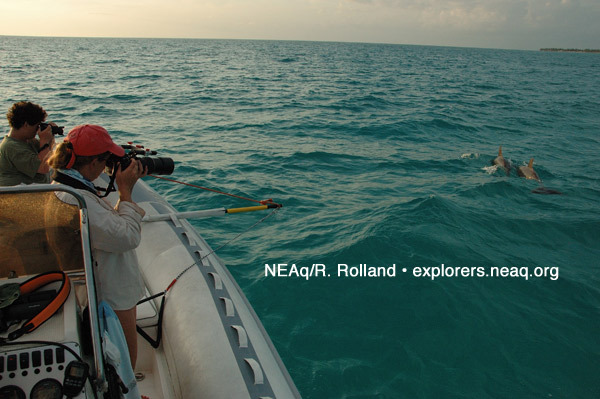 Swimmers went in the water nearly immediately, and we collected a sample at 4:30. The whales were very calm, allowing relatively close approaches, but the visibility was extremely poor, only about 40 feet. One of the males had a cluster of stalked barnacles surrounding his left tooth (see photo) – also visible in this whale is a pronounced hump behind the head, a feature that Diane believes is age related, and that appears to be are of most scarring in males. The other male (also quite scarred up) was missing the tip of his dorsal fin. 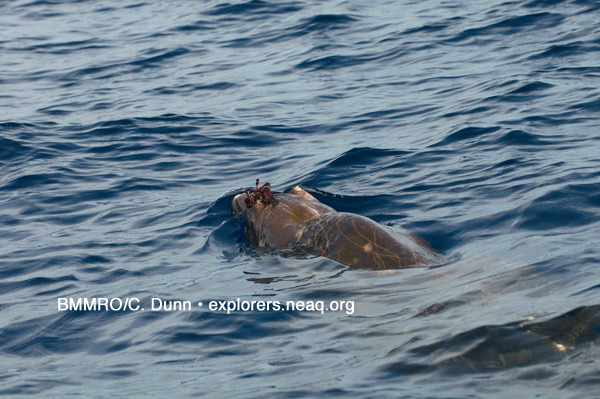 All in all, it looks like being a male beaked whale is a rough life! Whales dove deeply around 5:30 p.m., and with light diminishing, we head for home rather than wait the hour or so for them to re-appear. As a last hurrah, as we round rocky point for home, we encounter the resident bottlenosed dolphins again, who want to play. A couple of identification photos, and then a few sunset shots (art, not too much science), and we arrive home after 7. The weather is supposed to be calm for tomorrow, so we rushed to get the samples labeled and frozen, photos and data downloaded, cameras and binoculars cleaned and re-packed, so we can go to sea at the crack of dawn tomorrow.